Join us for public meetings with supporters throughout the State! 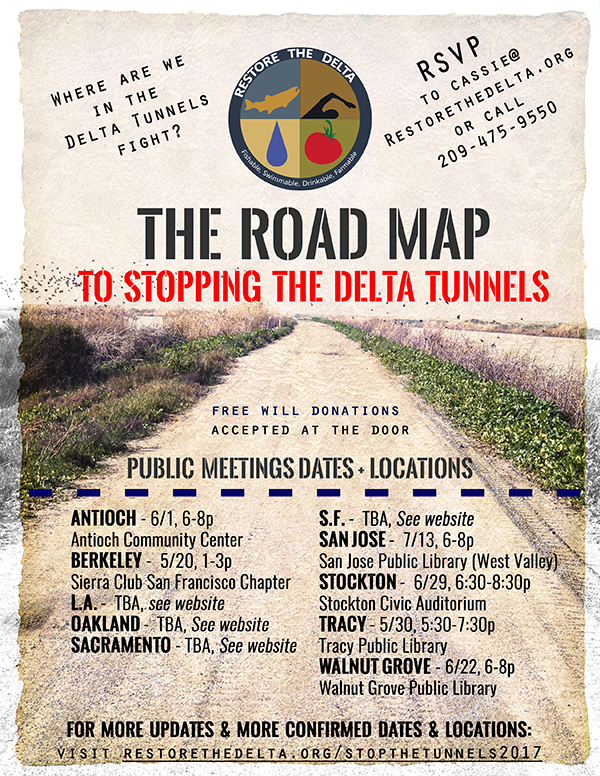 These public meetings are great for advocates of all knowledge levels on the Delta Tunnels project — new and long-time supporters. Get updates on where we are on the road map to stopping the tunnels and what needs to be done to stop this project once and for all through 2017-2018. For continued updates on dates & locations, check out this page on our website! RSVP to Cassie@RestoretheDelta.org, or by calling 209-475-9550. Fighting oil companies and the railroads is no easy thing, but in the last few weeks there was a win, then another, and another and the rout of the previously untouchable fossil fuel sector shows no sign of slowing down. From southern California to northern Washington, communities along the West Coast have dealt four massive blows to the fossil fuel industry over the past two months. Taken separately, each of these announcements represents years of work and tens of thousands of people refusing to put the health and safety of their families, communities and our climate at risk. Collectively, these decisions, which came in rapid succession, represent a shift in the acceptability of expanding fossil fuel infrastructure along our coast. Put simply, people are no longer willing to let the oil industry decide their future, to pollute their communities, to poison their bodies, and to irreparably harm our climate, by building new fossil fuel infrastructure.How did this transformation in the acceptability of fossil fuel infrastructure come about? For one, the dramatic and rightfully terrifying specter of fiery oil train derailments – and the oil industry’s blatant disregard for community health and safety – has ignited a broader revocation of the oil industry’s social license along the West Coast. Communities will not be sacrifice zones for oil industry profit. And behind the revocation of the industry’s social license is a big and beautiful movement that looks like America: a movement representing a tremendous diversity of identities and interests. In the past three years, we’ve seen firefighters, indigenous tribes, nurses, teachers, climate justice advocates, physicians, realtors, college students, developers, school boards and local elected officials across the political spectrum take a bold stance opposing oil trains. Communities recognize that extreme oil infrastructure is unnecessary, and they see the tangible transition to a clean energy economy on the horizon. What does this mean for the future of the oil industry along the West Coast? Well, if Shell’s announcement yesterday that it would bewithdrawing its request to build a new oil train facility in Anacortes, Washington, is any indication, the writing is on the wall. On August 9, the Whatcom County Council dealt a stunning blow to big oil by starting the process to suspend all new fossil fuel proposals for two months, an immediate moratorium that was extended for six months on September 27th. Why is this a big deal? Whatcom County has found itself at the center of a national debate around fossil fuel infrastructure since it could become a gateway for exporting everything from coal to gas to oil to the growing Asia Pacific market. The county council members’ August decision is likely a prelude to a permanent moratorium. The impact of this cannot be overstated – it prevents the growth of the coal industry across the west with no new markets to send it to. Oil giant Kinder Morgan is working to push through a pipeline full of controversial tar sands oil to the Port of Vancouver, BC, and if that doesn’t work they may to try deliver the toxic oil to a terminal in Whatcom County on the critical waters of the Salish Sea. Like the recently rejected coal export terminal, an oil export facility would bring the risks of spills and climate damage, with just a few jobs – a very bad deal for anyone but Kinder Morgan. Which is another reason the Whatcom County ordinance is such a big deal. On September 20, after a 3½ year fight, a city council in the small Bay Area town of Benicia denied a proposal for a new oil train terminal at the Valero refinery. 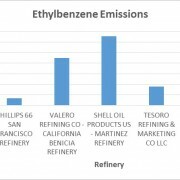 This stunning decision was, according to Benicia Mayor Elizabeth Patterson, the first time the city has voted against the refinery – a business that currently provides 20-25% of the city’s tax base. The city’s decision was made possible by tenacious organizing by local activists who garnered powerful opposition both in Benicia and in communities along the rail route stretching to Davis, Sacramento, and beyond. The Benicia City Council’s decision came on the heels of a ruling by the Surface Transportation Board (STB), a little-known federal agency that primarily handles disputes between railroads. The STB settled a dispute over whether or not, as Big Oil argued, federal regulation of railroads extends so far as to deny local governments land use permitting discretion over oil companies’ proposed oil train projects. Ultimately, the decision affirmed Benicia’s right to deny Valero’s project – a ruling that has already reverberated across the country and buttressed the City of Albany, NY’s challenge to an oil train facility there. The following week, on October 5, the San Luis Obispo County Planning Commission stunned oil giant Phillips 66 when it denied their permit to build a new oil train facility. The decision came after a nearly three-year review process, with tens of thousands of Californians opposing the project and more than 45 cities, counties, and school boards sending letters urging the planning commission to deny it. After these three rejections, the recently released environmental report that identified serious adverse impacts that cannot be mitigated and massive public opposition throughout Washington State, the writing was indeed on the wall for Shell’s Anacortes oil train proposal, and the company acted accordingly: it withdrew its application. Moving forward, there are still active oil train infrastructure proposals and existing oil train traffic that must be stopped. The movement is only getting stronger, and we won’t quit until every drop of extreme oil stays off the rails and is left in the ground where it belongs. We will keep doing this work, locked arm in arm with local communities, firefighters, teachers, doctors and more, a movement of people of all colors and creeds, united in a battle for our common future. It is a fight we cannot – and will not – lose. The Shell Martinez Refinery sent a letter to its neighbors this week, alerting them of expected activity in the area. The “large maintenance project” is expected to last until mid-June, the letter said. According to Ann Notarangelo, external relations manager, “it is a series of planned activities for maintenance at the facility. There may be some noise, minimal flaring and additional lighting. – Pacheco Blvd between I-680 to near Howe Road. Notarangelo told residents “if any of this activity is disruptive to you, or if you have a question or comment, we hope you will call our environmental hotline at (925) 313-3777. You can also follow what’s going on, at our Facebook page “Shell Refinery in Martinez” or on Twitter at “Shell_Martinez”. Notarangelo added that the last few weeks some residents have complained about lengthy traffic delays on Marina Vista because of Union Pacific switching trains during morning commutes. Some Shell employees were also caught in the delays. “Union Pacific has shared a phone number with us to pass along to you, in case you are caught in a delay and would like to report it. 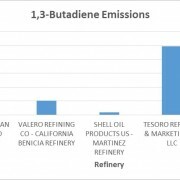 Refineries and petrochemical industry in the Bay Area’s refinery corridor are responsible for the majority of the risk-driving point source emissions in this region. 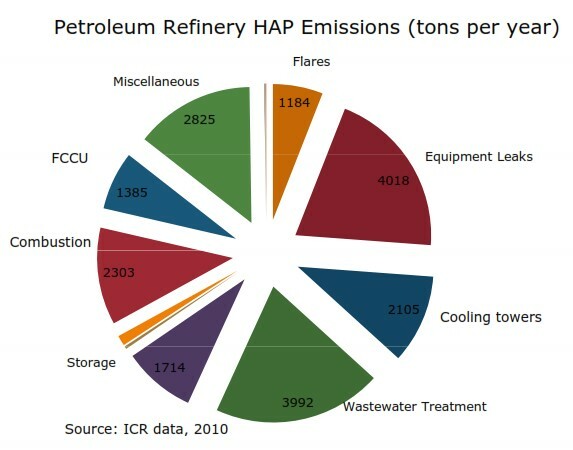 The Chevron Richmond refinery has the largest refining capacity and emits the most hazardous air pollutants (HAPs). The Tesoro refinery in Martinez and the Shell refinery in Martinez emit the most HAPs per barrel of oil (based on refining capacity). 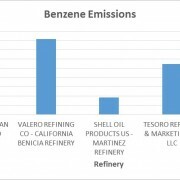 The Valero refinery in Benicia, the Tesoro refinery in Martinez, and the Shell refinery in Martinez emit the most criteria air pollutants (CAPs). If refineries increase their capacity and process more crude, the emissions of these various pollutants will invariably increase. New emissions rules need to prioritize ambient air quality and hold the Air District and elected officials accountable for policies that increase risk. The Bay Area Air Quality Management District is revising the rules for facilities that emit a variety of hazardous pollutants into the air. The current draft of the new rules could actually increase the amount polluters are allowed to emit. The communities at risk are speaking out to support policies that would reduce the amount of air pollutants rather than increase the limits. In support of these communities, the FracTracker Alliance has focused on analyzing the sources of air pollutants in the region. The East Bay Oil Refinery Corridor is located along the North Shore of the East Bay, stretching from Richmond, CA east to Antioch, CA. The region has been named a “sacrifice zone” for the heavy concentration of petrochemical industrial sites. In addition to the five refineries along the north coast, these communities host a variety of other heavy industries and waste sites. The locations of these facilities have been mapped previously by the FracTracker Alliance, here. In the report we found that people of color, specifically African Americans, are disproportionately represented in the community demographics. Novel results indicate that Hispanic students may be disproportionately impacted by the presence of the petrochemical industry. In this post, we continue the analysis of risk in the region by providing an analysis of the contributions to air pollution from these facilities. Hazardous air pollutants (HAPs), which includes a list of 594 carcinogenic and non-carcinogenic chemicals that pose a risk to those exposed. The new rules drafted by the BAAQMD to regulate emissions from the East Bay Oil Refinery Corridor would not cap emissions at any level. The current proposal outlines limits on emissions per barrel, promoting efficiency rather than focusing on emissions reductions. Air quality in the refinery corridor could be improved only if this approach was proposed in conjunction with emission limits or reductions. But as the currently proposed rules stand, emissions could actually increase. Enforcement procedures for infractions are also limited. 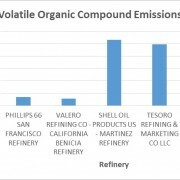 If a refinery’s emissions violate the per barrel standards, the refinery has a whole 3 years to address the violation. Also, these new rules come at a time when refineries are moving to increase the volume of crude coming in from other regions, such as Canada’s tar sands and the Bakken Shale. These regions produce much lower “quality” crude oil, with much higher emissions. This all amounts to more air pollution rather than less. Community and environmental activist groups such as the Communities for a Better Environment (CBE) and the Bay Area Refinery Corridor Coalition have raised specific issues with the proposed rules as they stand. First, they allow for increase emissions when Air District data forecasts increasing refinery emissions, despite declining local and domestic fuels demand. Refining the lower quality crude is more energy intensive, which also results in increased emissions. In order to offset the increased emissions, CBE reports that refineries can just increase total refining production to decrease per barrel averages. This would in affect increase emissions to meet regulatory requirements. In addition, transporting the crude via new shipping routes would put additional communities at elevated risk of railway accidents (CBE, 2015). 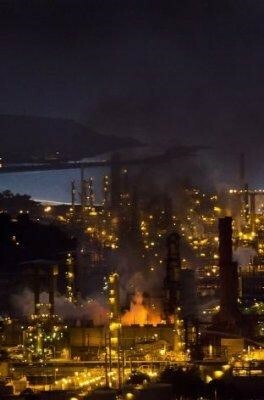 Air quality in the Bay Area has been continuously improving over the last few decades, but these refinery communities are still at a significantly higher risk of dying from heart disease and strokes. The largest disparity is felt by the African-American populations. Data for Richmond, CA shows they are 1.5 times more likely to die from these diseases than the Contra Costa county average (Casanova, Diemoz, Lifshay, McKetney, 2010). 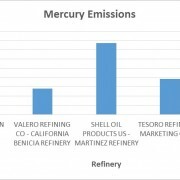 Emissions reductions not only favor the local communities such as the refinery corridor that are most impacted, but also all of the downwind communities, specifically the Central Valley. The Air District’s 2012 report of PM provides a summary of these trends. PM is an important because it is “the air pollutant that causes by far the greatest harm to public health in the bay area. It is a useful indices because there is a linear correlation between increasing ambient concentrations and mortality. Figure 2 shows the progress the Bay Area has made, overall. This graph is based on regional monitors and not those in the refinery communities, where improvements have not been as drastic. In Figure 3 below, the graph shows major pollutant drivers of seven health risks and how health impacts have been reduced over this time period. What we see from the bar graph, is that non-diesel anthropogenic point sources of PM contribute the most to risk for the majority of health endpoints considered. 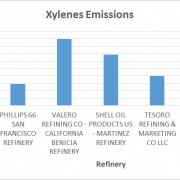 Across the entire bay area, refineries account for 6% of all PM (BAAQMD, 2012). An overview of other chemicals associated with the petrochemical industry in ambient air and their resulting health effects are outlined in tables 1-3 below. This is by no means a comprehensive list, but these are chemicals of primary concern, specific to petroleum refinery emissions, and are known risk drivers for the region. Figure 2. Measurements of PM, averaged across the entire bay area, over time – showing an overall improvement in air quality. Figure 3. Contribution of different species of air pollution to health impacts. The analysis is specific to the bay area and compares health risks estimates from the past (1980s) to estimates in 2012. Benzene, Toluene, Ethylbenzene, Xylenes Neurological effects, Irritation of the eye, skin and respiratory tract Blood disorders (reduced number of red blood cells and aplastic anemia), cancer. With these gains in ambient air quality it is hard to fathom why regulators would consider allowing refineries to increase emissions inventories. 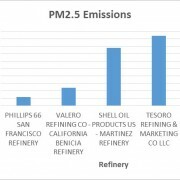 For this analysis, the focus was to map and compare emissions inventories from numerous industrial sites, with a particular focus on the petroleum refineries. 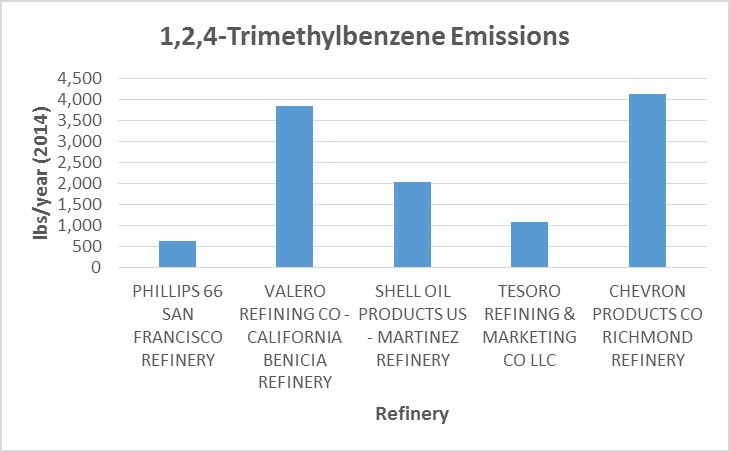 Current refinery capacities as of 2014 are shown in Figure 4, below. The Richmond Chevron has the largest refining capacity in the region, by far. Refining capacity is the maximum amount of crude oil the refinery is allowed to refine, according to their permit. Refining capacity numbers are used in place of actual refined crude volumes for this analysis, because actual crude volumes are considered proprietary information and are not published by the California Energy Commission (CEC). 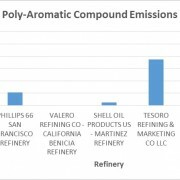 The Richmond refinery has a raw crude (atmospheric crude is the technical term) refinement capacity over twice as large as the Phillips 66 San Francisco Refinery, and almost 40% larger than the Tesoro (Golden Eagle) refinery, which is the second largest in the region. According to the newly proposed rules, this would allow the Richmond refinery to emit the most pollutants. Figure 4. Operating capacity of refineries. The bars show the maximum amount of crude the refineries are allowed to process daily, in barrels (1 barrel = 42 gallons). These refineries along with the other industrial sites in the region have been mapped below in Figure 7. The data has been displayed to show the HAPs emissions from these facilities. The amounts of emissions are shown with graduated circles. The larger the circle, the higher the emissions. The cumulative summation of HAPs is a good value for comparing between facilities with diverse emission inventories (the list of all species of emitted pollutants), but different HAP chemicals have very different effects, both in magnitude and in health impacts. Different chemicals will affect different body systems, as described above in Tables 1-3 above. We have therefore incorporated individual chemical data into the map as well (Figure 7, below). The data displayed shows the total sum of HAPs emitted (in lbs/year) from petrochemical industrial facilities in the region. Explore the map to see emission sources for a selection of important pollutants. Smaller industrial sites/sources have been left out of the map. If you open the map into its own page, you can toggle between individual chemical emissions from these facilities. Use the layers tab to change the chemicals displayed. For more information on the individual chemicals, continue reading below. This unique selection of pollutants was chosen by identifying the highest health risk drivers in the region. They are known to increase both cancer and non-cancer risk for residents in the bay area. 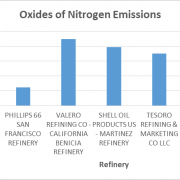 The graphs that follow show the emissions inventories reported by each refinery. The refineries are organized on the X –axis according to increasing refining capacity, as they are in Figure 4, above. 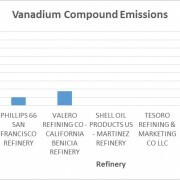 Analysis of the graphs show that the Richmond Chevron facility is a largely responsible for 1,2,4-trimethylbenzene, naphthalene, hydrogen cyanide, PAH’s, vanadium, lead and nickel compounds. 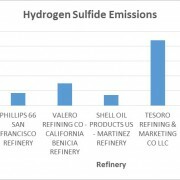 The Tesoro refinery is mostly responsible for almost all of the 1,3-butadiene, and most responsible for hydrogen sulfide and VOCs. Shell is mostly responsible for the ethylbenzene, much of the mercury and sulfur dioxide emissions, and the most VOCs. 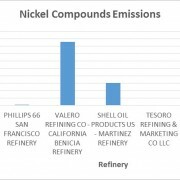 Valero in Benicia is responsible for much of the 1,2,4-trimethylbenzene, all BTEX compounds, the most nickel compounds, and the most oxides of nitrogen. 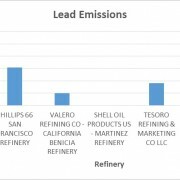 And finally, the Phillips 66 refinery in Rodeo with the lowest operating capacity also had the lowest emissions in almost every case except lead, which was very large compared to all refineries except Chevron Richmond. 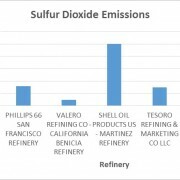 The Valero refinery in Benicia, the Tesoro refinery in Martinez, and the Shell refinery in Martinez emit the most criteria air pollutants (CAPs), including PM2.5 (particulate matter with a diameter less than 2.5 um), sulfur dioxide, and oxides of nitrogen. Emissions from marine terminals are also a significant source of HAPs and particulate matter. In the map in Figure 7, the marine terminals are shown with yellow markers. Their relative contributions of total hazardous pollutants are much less than the refineries and other sources, but when we look at specific risk drivers, such as 1,3-butadiene and benzene, we find that their contributions are quite sizable. Marine terminals are also a key component for the refineries looking to access more low-grade crude. Increasing the refining capacity of the refinery will also increase the emissions from the terminals. Like oil spills from tankers, there are other risks of industrial accidents for refineries that need to be considered. Accidents or incidents may occur that result in a sudden, large release of air pollution. 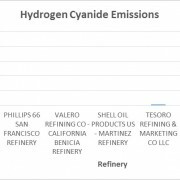 Looking at the emissions data, the Richmond Chevron refinery with the largest production capacity may seem to be an efficient station compared to the other refineries. However, an explosion and large fire in 2012 there sent 15,000 community members to local hospitals with respiratory distress. The SF Chronicle’s coverage of the story can be found here. (Fire shown in photo right.) The incident resulted from pipes corroding and failing, and the facility failing to make the decision to shut down the process. The resulting plume of smoke is shown in the cover photo of this article. Other major explosions and fires have occurred in the recent past, as well, including a flaring incident in 2014, a fire in 2007, and two other explosion and fire events in 1999 and 1989. Of course these events are not unique to the Chevron refinery. 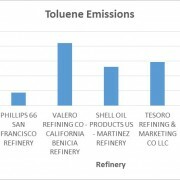 The Tesoro Golden Eagle refinery has a reputation of being the most dangerous refinery in the country for occupational hazards, and has one of the worst track records of violations. If refineries increase their capacity and process more crude, the emissions of these various pollutants will invariably increase. Increased emissions elevate risk for surrounding communities, and in the bay area these communities already bare a disparate burden. Additionally, many of the pollutants will be transported with the prevailing wind that blows from the coast up the river delta and into the central valley. 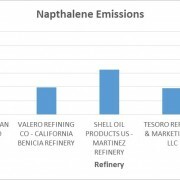 In FracTracker’s recent analysis of impacted communities in the refinery corridor, maps of air quality showed that the refinery communities are some of the most impacted in the entire bay area. In addition, California’s Central Valley has some of the worst air quality in the U.S. Click here to view maps of state air quality of disproportionate impacts by us using CalEnviroScreen 2.0. While many of the HAPs have a greater local impact, others such as ozone have regional impacts, while others like mercury are transported globally. What we find in this report is that the refineries and petrochemical industry in the refinery corridor are responsible for the majority of the risk-driving emissions in this region. When the risk and total emissions are averaged for the entire Bay Area, the risk outcomes are much less than for those living in the communities hosting the industries. New emissions rules should prioritize contributions of emissions to ambient air pollution loads. The biggest issue with using a “per barrel” emissions limit is that it prioritizes the refining capacity rather than mitigating the existing health impacts. These types of policy decisions deal directly with risk management. The Air Management District must decide what amount of cancer and disease are acceptable to keep the refineries in the communities. An upper limit on emissions makes it easier to set a risk limit, an upper bound for health impacts. The upper limit also holds the Air Management District and elected officials accountable for their policy decisions. U.S.EPA. 2011. Addressing Air Emissions from the Petroleum Refinery Sector U.S. EPA. Accessed 3/15/16. Casanova, D. Diemoz, L. Lifshay, J. McKetney, C. 2010. Community Heath Indicators for Contra Costa County. Community Health Assessment, Planning and Evaluation (CHAPE) Unit of Contra Costa Health Services’ Public Health division. Accessed 4/15/16. BAAQMD. 2012. Summary of PM Report. Bay Area Air Quality Management District. Accessed 4/15/16. Crucial City Council Meeting this Wed, March 9th – 2 Major Topics! Alhambra Hills AND Pine Meadow! Feb 12 Valero Energy Corp’s proposed oil-by-rail project at its northern California refinery was quashed by local planners this week, the first such facility on the U.S. West Coast to end a years-long wait for permits with a rejection. The Benicia Planning Commission late Thursday unanimously renounced Valero’s request to build the project at the conclusion of four consecutive public hearings dominated by scores of opponents. 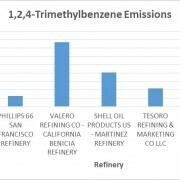 Valero first proposed building the rail facility at its 145,000 barrels per day Benicia refinery to offload up to 70,000 bpd of inland U.S. and Canadian heavy crude three years ago. Several other West Coast rail projects await such decisions by local or state governments. Those include Tesoro Corp’s proposed 360,000 bpd railport in Washington State – the largest in the nation – and Phillips 66′s newly-trimmed 25,000 bpd facility at its Santa Maria refinery in Arroyo Grande, California. Others gave up with U.S. crude prices down more than 70 percent since mid-2014 on global oversupply. That decline squeezed discounts of inland U.S. crude to global crudes, eroding oil-by-rail’s profitability. Global Partners LP last month laid off workers and said the company would drop crude handling at its ethanol terminal in Oregon in the fallout of the oil rout. The staff for Benicia’s planners recommended approval. When Valero first proposed the project, oil-by-rail was growing fast and U.S. and Canadian crudes were much cheaper than global crudes, even with added transportation costs of moving via train. Rail also gave West Coast refiners a way to tap those crudes as no major oil pipelines cross the Rocky Mountains. Not anymore. Shipments originating on top U.S. railroads fell 23 percent by the third quarter last year from the peak of 1.02 million bpd in the third quarter of 2014, according to the American Association of Railroads. The Tesoro project remains under review by a state council in Washington, which will hold hearings in June and July. San Obispo County planners are expected to decide on the Phillips 66 project next month, the company said. Staff for those planners recommended rejecting the facility. STOP THE LATEST EFFORT TO BRING CRUDE BY RAIL TRAINS TO CONTRA COSTA AND SOLANO COUNTIES! after all speakers are heard! Individuals can sign up by calling the Planning Department (707-746-4280). It’s not clear if you have to wait until Monday the 8th to phone. ALSO, PLEASE SIGN THE PETITION: Over 1300 of you have already signed the Safe Benicia petition. If you have not yet signed, please do so now. Add your personal comments or just push the button. On Thursday, January 28, 2016, Benicia staff released the agenda for the upcoming Planning Commission final hearings on Valero Crude by Rail. Included along with the agenda was a 41-page staff report recommending approval of the project, and outlining a new sign-up procedure for those who want to comment at the public hearing. Like the massive 3-volume Final Draft of the EIR, city staff chose to ignore critical input and to hide behind “federal preemption” in order to cater to the desires of our giant corporate neighbor, Valero. Benicia residents are sorely disappointed with the decision of our city employees to disregard the health and safety of Benicians and others uprail in Davis, Sacramento and beyond. The staff recommendation relies on the very same reasoning used by San Luis Obispo County staff to DENY a crude by rail project: what happens uprail can’t be controlled. Because we can’t control Union Pacific, because only the Feds can have a say about rail shipping beyond local jurisdictions, we throw up our hands, while San Luis Obispo staff says, basically, ok, we’re not helpless, we can stop it HERE. BAAQMD – Stand Up Against Bay Area Tar Sands Projects!!! News: Late Monday San Luis Obispo County proposed to DENY Phillips 66 permits to deliver by oil train and refine tar sands oil! • SLO County’s brave stand comes just after its final EIR admits our communities were correct that this is a TAR SANDS PROJECT–the project is as bad as its EIR finds, and worse due to tar sands refining impacts. • SLO County’s stand PROTECTS THE BAY AREA FROM OIL TRAINS AND RODEO REFINERY EMISSIONS! • Bay Area air officials should publicly support SLO County’s proposal to deny this project that threatens air quality here too, and we await their announcement—the BAAQMD should have stood by us when we first learned of Big Oil’s cover-up of its oil switch! NOW, AT A MINIMUM, OUR AIR DISTRICT SHOULD STAND PUBLICLY FOR ITS SISTER AGENCY’S CORRECT PROPOSAL.